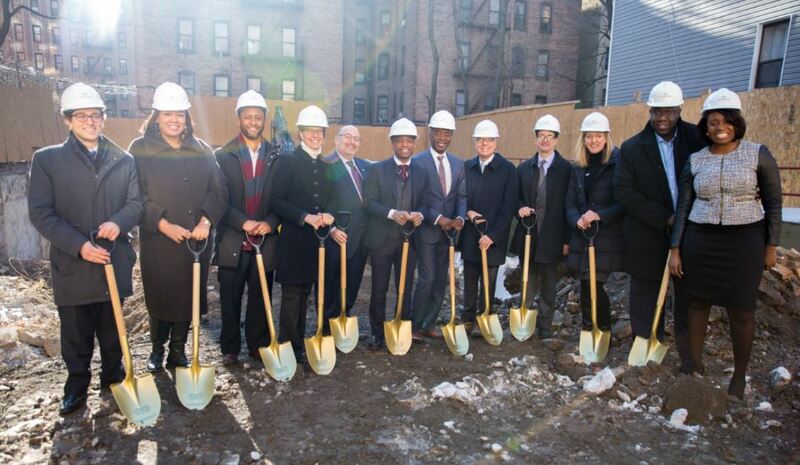 Tuesday’s groundbreaking marked the start of construction on three multifamily rental buildings with 138 affordable apartments in the Bronx called The Grand. The project is part of Governor Cuomo’s $20 billion, five-year plan launched last year to provide permanent supportive housing, affordable housing with on-site services that help formerly homeless and disabled tenants live in dignity in the community, by constructing and rehabilitating 100,000 units of affordable housing and 6,000 units of supportive housing. The Grand is the largest ground-up, low-cost tax-exempt bond deal developed by a minority-owned firm, Thorobird Companies, since Governor Cuomo took office. “The Bronx is a thriving model for New York and the rest of the country of how safe and decent affordable housing can change lives while enriching neighborhoods,” Governor Cuomo said. Since 2011, HCR has built and preserved 12,624 units in the Bronx, with nearly $600 million in financing HCR resources, leveraging more than $2.3 billion in other public and private resources. 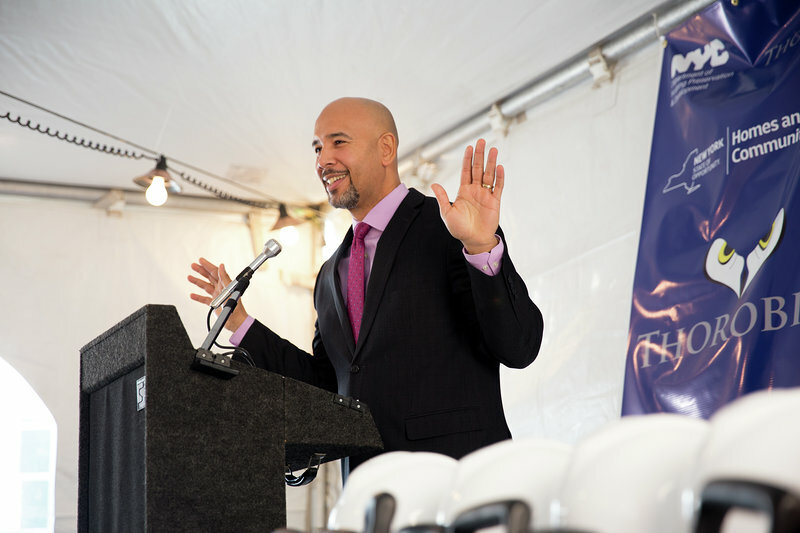 Bronx Borough President Ruben Diaz Jr. said, “Creating affordable housing units was a top priority since my first day in office, and the work we have done in the Mount Hope and Morris Heights neighborhoods are a testament to the efforts we are putting in to make this happen. Diaz thanked Thorobird and ACMH on this partnership, as well as Gov. Cuomo and all the New York City agencies that are working to continue the borough’s growth. Commissioner of New York State Homes and Community Renewal, RuthAnne Visnauskas, said, “The Grand is a reflection of Governor Cuomo’s commitment to growth in the Bronx and a profound statement that when we build our city and our state, we include everyone in the process. Councilman Fernando Cabrera said, “This is an important day and a major step in addressing the urgent need for affordable housing in my district.” Cabrera provided $250,000 in capital funding for the Grand and credited the forward thinking of Governor Cuomo and Thorobird in providing socially impactful development in distressed urban communities. The Grand will provide high quality affordable homes close to public transportation, one block from the B and D subway lines to help to create vibrant, livable communities. It will also feature community and recreation facilities, including landscaped rooftop decks to encourage resident engagement. Each of the three rooftops will also house a solar panel array, which will power some of the buildings’ energy needs. Forty-one of the 138 apartments in the three buildings will be set-aside for formerly homeless adults with a serious mental illness and will be permanently supported by rental subsidies and support services. It will be funded by Empire State Supportive Housing Initiative, the services and operating funding component of the Governor’s housing plan, administered by the New York State Office of Mental Health. Eight units will receive Project Based Section 8 rental assistance vouchers through an allocation from New York City Housing Preservation and Development. Assemblymember Victor Pichardo said, “The Grand’s proposed units will unequivocally help address the housing needs of our hardworking Bronx families, while maintaining dignified housing for our most vulnerable populations. It is also encouraging to see that the building units will include 21st century sustainable energy conservation technology. The $65 million development is a partnership with New York State Homes and Community Renewal; Thorobird Companies, a minority-owned firm; the Association for Rehabilitative Case Management & Housing, Inc., a not-for-profit supportive housing provider; and New York City Department of Housing Preservation and Development. The total development cost for this project is $65 million. More than $46 million in financial support for the three buildings will be delivered by NY Homes and Community Renewal, including $32.6 million in tax-exempt, private activity bonds. The development is also supported by financing from both HCR’s Supportive Housing Opportunity Program and Middle Income Housing Program. Other public and private resources include $14.5 million from the City of New York Department of Housing Preservation and Development through HPD’s ELLA program and Mayor de Blasio’s Housing New York 2.0 plan; $500,000 provided by Bronx Borough President Ruben Diaz, Jr. Councilmen Fernando Cabrera and Ritchie Torres each supported the project with $250,000 from New York City Council capital funds.